After being diagnosed with breast cancer at the age of 32, and with the number of cancer diagnoses in my family, you bet I was going to try to find out why I got it. Although we don’t really know why we get cancer, I was “lucky” to find a possible cause to mine. You see now why I wanted to look closer. As soon as I was diagnosed with breast cancer, a group of genetic “investigators,” as I called them, at my hospital came to my rescue, wanting to know why I was diagnosed at such a young age. I wanted to know too, so I opted to be tested for the familiar BRCA1/2/BART genetic mutation tests which are linked to breast and ovarian cancers. Those results came back negative for me. I was simultaneously happy and skeptical. It didn’t make sense to me that I didn’t have a mutation considering my family history. As the genetics team explained to me, these results didn’t mean someone else in my family doesn’t carry the BRCA gene(s), or that I myself don’t carry a different mutation. At the time, scientists had only identified a few mutations (such as the BRCA), and I was negative for those specific to my cancer. I had the option to learn about my genetic makeup as a whole or just focus on the results that will potentially impact my cancer outlook and treatment choices. I chose to learn about (1) genes related to all cancers and (2) genetic factors that may impact my future children (such as genes related to birth defects). I chose not to find out about my genetics for other common diseases such as Alzheimer disease and Parkinsons diseases. Why would I want to stress myself with knowledge about something else I cannot control or prevent? No thanks. When I came to see the genetics team to receive my genome sequencing test results, my counselor had a big smile when she saw me. She knew how desperate I had been to get answers about my cancer. “I have good news,” she said. I stopped smiling and braced myself. Was she going to tell me I had no mutation? She placed the results on the table and allowed me to read them. 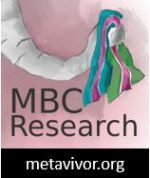 I had one mutation: ATM (ataxia-telengiectasia mutated) — a mutation associated with a moderate risk for breast cancer, and some lesser risks for other types. “You look disappointed, everything OK?” She asked. I was surprised. Even though I have breast cancer, I was expecting they would identify a mutation that was linked to ovarian cancer, too. I always feared getting ovarian cancer because of my grandmother. I saw her go through it. Seeing her go through all that pain affected me a lot, especially because she raised me. She was genetically the closest of my relative to have been diagnosed. In my mind there was a possibility I would get it too. I wasn’t worried about breast cancer because the only one who developed it from my family was my great-grandmother. In fact, prior to my diagnosis, my general doctors had told me that that particular diagnosis was too far away from my generation, so I had nothing to be concerned about. One thing I learned after my diagnosis though was that both breast and ovarian cancers are linked. Once you are diagnosed with one, your risk of developing the other goes up. I had an observation too: My grandmother’s pathology report and mine were very similar although our cancers developed in different parts of our bodies. However, my genetic mutation was linked mainly to breast cancer not ovarian cancer. Having identified the ATM mutation, my doctors advised me to get yearly breast MRIs, in addition to getting mammograms, which I had already been getting due to the density of my breasts. No additional recommendations were made. Some people choose not to know about their genetics, especially those who have not been diagnosed with a disease. I can imagine the level of worry they may develop after learning they are a mutated-gene carrier. But it was different for me. For me, the more information I receive the better. Knowing my risks can help me take preventative measures. Plus I had already been diagnosed with cancer. I was desperate to find something to blame. And for the first time since my diagnosis, I felt a sense of peace. I was getting part of the answer to my puzzle. There’s still a chance my mutation didn’t cause my cancer, but there is a high chance it did. And this brings me closer to finding closure. I will be performing more genetic testing in February, specifically to look for risks associated with breast and ovarian cancers. I will have more information to share with my family— at least those who are open to receiving the information. But that is for another post. This entry was posted in Coping after cancer, Genetics and tagged Family planning, Genes, Mutations. Bookmark the permalink.